Click here to watch a video announcement from AMSOIL Co-Presidents Alan Amatuzio and Dean Alexander. New Changes have been announced by AMSOIL Inc. regarding FREE Shipping for Preferred Customers with at least $100.00 in product order and FREE Shipping for Dealers with at least $350.00 in product order. For information about becoming a Dealer or Preferred Customer with the #1 Synthetic Lubricant Company in America or being a Retail On The Shelf Account or a Commercial Account, contact me at http://www.The1stSyntheticoil.com or call 1-800-777-7094 http://www.amsoil.com and inform the operator you are working with ZO 9792. New regulations on fuel economy and emissions have pushed the automotive industry to develop smaller, more efficient engines. The Prominence of direct injection (GDI) and turbochargers employed to meet rising corporate average fuel economy (CAFE) standards in placing new burdens on motor oil. Low Speed pre-ignition (LSPI) and increased engine temperatures are two of the more serious challenges to arise from the use of GDI and turbos. Two new gasoline engine oil specifications have been developed to address these issues. After months of vigorous testing, we’ve (AMSOIL) produced new formulations that FAR SURPASS the latest standards and add another level of performance and protection to an already solid foundation. And the best news of all is there will be NO price increase of AMSOIL’S all ready #1 products. For more information about these products and other great AMSOIL products go to http://www.amsoil.com or http://www.The1stSyntheticoil.com. Should you desire to purchase AMSOIL products you can call 1-800-777-7094 and inform the operator you are working with ZO 9792. After holding the line on pricing in the U.S. for the past five years, we are forced to implement a minimal price adjustment effective Aug. 1. The costs of base oils and other raw materials have increased significantly in the past few months, while the costs of every aspect of manufacturing and distribution have increased over the past five years. The accumulation of those increased costs requires an average price increase of 6 percent on many AMSOIL products. Commissions will be increased accordingly. The renewed strength of the Canadian dollar and relative stability of the exchange rate has allowed us to leave Canadian pricing as it stands. Updated pricing information will be available in the Product Pricing Interface in the Dealer Zone as soon as possible. We will notify retail and commercial accounts by mail and online, but you should follow up with your accounts to ensure they are aware of the pending price adjustment. The AMSOIL U.S. Wholesale Price List (G3500) and Dealer Profit List (G3501) will be revised to reflect new pricing and commissions; watch the Dealer Zone for an announcement of availability. The AMSOIL Retail Catalog (G100) will also be revised and made available as soon as possible. Since the price adjustment occurs close to the regularly scheduled October catalog revision, you will receive a copy in your September issue of AMSOIL Magazine rather than the October issue. For more information about the #1 Synthetic Lubrication company in America, go to http://www.amsoil.com or http://www.The1stSyntheticoil.com. Should you desire to purchase products prior to the price increase give the operator ZO 9792. Another NEW AMSOIL Motor Oil recently added to the Inventory should make Ford Owners content with the addtion of the 5W – 50 Signature Series 100% Motor Oil..
AMSOIL Signature Series Synthetic Motor Oil delivers extraordinary lubrication in all types of automotive gasoline engines. By combining industry-premier synthetic technology with AMSOIL premium additives, Signature Series Synthetic Motor Oil exceeds the higher performance demands of modern engines. AMSOIL Signature Series Synthetic Motor Oil provides outstanding anti-wear protection. It develops a strong fluid film that keeps metal surfaces separated while its robust anti-wear additives further reduce wear in metal-to-metal contact regions for maximum engine life. In the Sequence IIIG test, which is normally run for 100 hours, AMSOIL Signature Series Synthetic Motor Oil delivered outstanding wear protection for the camshaft and lifters, even after doubling the test interval to 200 hours. For details, see the Double-Length Sequence IIIG Engine Test Technical Study (G3320). Excess piston deposits can lead to pre-ignition and engine knocking, which results in lost power, reduced fuel economy and, in severe cases, engine damage. Signature Series’ premium additives and naturally high resistance to extreme heat help keep pistons clean for maximum engine performance. After a double-length, 200-hour Sequence IIIG engine test, Signature Series demonstrated outstanding cleanliness properties and shattered the requirements of a 100-hour test. Modified engines (non-stock) and those using E85 fuel are excluded from extended drain recommendations. Change at the vehicle manufacturer’s recommended drain interval outside U.S. and Canada. AMSOIL Ea® Full-Flow Oil Filters are designed for extended change intervals. With other brands, do not exceed six months or 10,000 miles unless longer intervals are recommended by the vehicle manufacturer. Check oil regularly to maintain proper fill levels. This product is not expected to cause health concerns when used for the intended application and according to the recommendations in the Safety Data Sheet (SDS). An SDS is available via the Internet at http://www.amsoil.com or upon request at (715) 392-7101. Keep Out of Reach of Children. Don’t pollute. Return used oil to collection centers. For further information go to http://www.The1stSyntheticoil.com or http://www.amsoil.com. Should you desire to purchase this product or others call: 1-800-777-7094 and give the Operatior ZO 9792. You can become an AMSOIL Dealer or Preferred Customer and purchase products at a savings of 25%. Offer only good for online/catalog orders shipped to a valid address in the continental U.S.
AMSOIL, the #1 Synthetic Lubrication Marketing Company in America if offering FREE Shipping to online/catalog customers who place orders of $100 or more. If the order is less than $100 then a standard rate of $8.50 will be charged for shipping. To see the AMSOIL Product line go to http://www.amsoil.com or http://www.The1stSyntheticoil.com. Should you desire to purchase product you can call 1-800-777-7094 and give the operator Account #9792. AMSOIL Testing of their 100% 25,000 mile or one year service life 5W – 30 Engine Oil against other products such as Castrol Edge with Titanium Fluid Strength, Lucas, Mobil 1 Extended Performance, Pennzoil Ultra, Petro Canada Supreme, Quaker State Ultimate Durability, Red Line High Performance, Royal Purple High Performance and Valvoline SynPower, all Synthetic oils shows WHY AMSOIL is superior in performance and cost. Each oil was subjected to the following ASTM test methodologies: Four-Ball Wear Test, Total Base Number, Cold Cranking Viscosity, Thermo-Oxidation and NOACK Volatility Test. 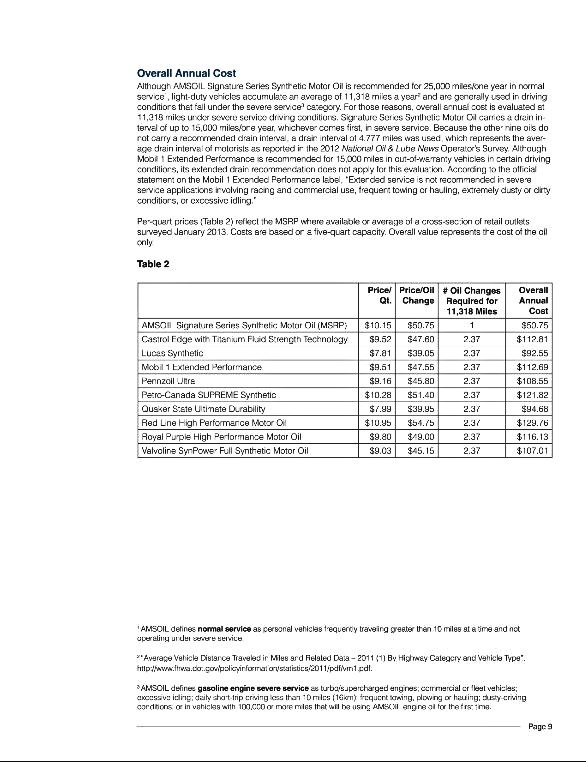 Overall costs were determined using a mileage figure of 11,318 miles SO since the AMSOIL has a 25,000 Mile/1 year Service Life, one can double the costs of OTHER oils when looking at overall cost for a one year time period. AMSOIL, the Leader in Synthetic Lubrication, continues to provide the BEST Products anywhere to customers across America and Canada. For further information about these products and others go to www.amsoil.com or www.The1stSyntheticoil.com. Should you desire to purchase these products or any of the other AMSOIL products call 1-800-777-7094 and give the operator ZO 9792. AMSOIL, the market leader in Syntheic Lubrication, continues to expand their inventory of products all designed to save people downtime and money. Four new products were released to dealers and the public on March 1 2012. Those four are listed below. AMSOIL Motorcycle Octane Boost (MOB) increases octane up to three numbers for maximum power and efficiency. It is designed to improve startup performance and eliminate engine ping or knock for increased power at low-rpm operation. It contains detergents that help maintain cleanliness of combustion chambers and fuel delivery systems for optimum performance. At the recommended treat rate, it does not harm catalytic converters or oxygen sensors and is compatible with other AMSOIL fuel additives. Motorcycle Octane Boost is available in the U.S. only. AMSOIL Synthetic Multi-Purpose Grease and Synthetic Water-Resistant Grease have been reformulated with calcium sulfonate complex thickeners to provide even better protection and performance. The new thickener allows Synthetic Multi-Purpose Grease and Synthetic Water-Resistant Grease to provide improved extreme-pressure properties, corrosion resistance, oxidation resistance, high-temperature stability and water resistance at the same price as the previous formulations. AMSOIL Synthetic Multi-Purpose Grease and Synthetic Water-Resistant Grease are now available in convenient 3-oz. cartridge sizes (GLC3P, GWR3P), designed for use with the new AMSOIL Grease Gun. The Grease Gun Kit (GLCKT) includes a 3,600 psi spring-loaded grease gun, flexible hose and 3-oz. cartridge of Multi-Purpose Grease. For further information about these “New” products and other outstanding cost saving products manufactured by the Superior, Wisconsin based company since 1972 can be found at www.amsoil.com or www.The1stSyntheticoil.com, or www.lubedealer.com/southeasternlubricants. Should you desire to purchase AMSOIL products you can call 1-800-777.7094. Tell the operator you are calling after information from ZO 9792 and become a Catalog Customer or become a Preferred Customer and purchase at a 25% saving.